How did OiNK get away? "I'm not criminally liable for secondary infringement, officer!" It was supposed to be the British equivalent of high-profile cases such as PirateBay and the Jamie Thomas trial. It was supposed to act as a clear deterrent to a new generation of file-sharers against widespread copyright infringement. Instead, Alan Ellis, the founder of torrent tracking site OiNK has been acquitted of the charges of conspiracy to defraud. How did this case turn from sure thing to nightmare for the music industry? OiNK was not your typical torrent tracker site. Websites such as PirateBay, Isohunt, and TorrentReactor are free to use and available to the wider public. OiNK was a free-of-charge closed service, available only by invitation from an existing member, which could be obtained by paying $5 USD. The site also operated through donations, which amounted to a staggering $300,000 USD. OiNK’s statistics are impressive, it boasted 200,000 registered users, and it facilitated the exchange of 21 million files. I am going to go out on a limb here and claim that most of those files were infringing copies. 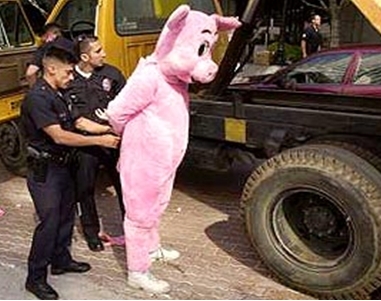 So, it is clear that OiNK was in the wrong, and the fate of Mr Alan Ellis was sealed, right? Not really. The problem seems to have been that prosecutors chose to charge Mr Ellis with conspiracy to defraud, instead of anything related to copyright infringement. This meant that they had to prove Mr Ellis was trying to defraud his customers, when it was clear that he was offering a service, and his clientèle knew fully well what they were getting into. No fraud then. This clearly assumes that criminal commercial infringement will take place through some physical medium, and seems to preclude facilitating online acts. It seems then that prosecutors were not sure to obtain a conviction through copyright infringement. OUT-Law makes a good point that the best way to proceed was to pursue OiNK for authorising copyright infringement, which is a civil offence for secondary infringement (see s24(2) CDPA). Good news for OiNK may be bad news for the rest of us, as I am afraid that the music industry may use this verdict to push for stronger copyright protection in the upcoming Digital Economy Bill. It is clear that some torrent sites operate at the very fringes of acceptable behaviour. As some independent musicians have pointed out in an interesting Guardian blog article, torrent sites may be guilty of not doing enough to curb infringement. If legislators are presented with an idea of a virtual Wild West where everything goes, we may be in for a rough awakening when the Bill eventually gets through Parliament. It may be worth mentioning that no matter what measures they put in the digital economy bill it won't stop people sharing files. They will just find another way. The business model is busted. All the bill will do is put people off using the internet. Just the opposite of what government is paying out a fortune to achieve. It is the most stupid waste of time and money there has been for a long time. All to protect a group who don't deserve protection. They have systematically ripped off the youth for decades. The game is over now. People will pay a fair price for a good product. Because the product has been overpriced for so long they have found a cheaper way. Radio stations play what the producers want. With the internet the kids can hear the music they want, when they want it. Government are not gonna win this one. I don't file share, but I can see where the kids are coming from, and gov is wrong. Mandy is mad. Voluntary Collective Licensing is the way forward.